Kitchen Emporium are available throughout the Northwest. 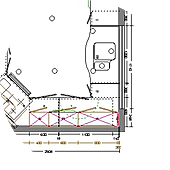 We offer full project management, from initial planning through to final design and installation. Our Wigan Showroom has a huge range of fitted kitchens on display for you to browse in a warm and friendly environment. We have all ranges from the classic to modern and we are proud to offer a kitchen showroom with a difference, why not pop in to see what makes us different? Our showroom is in a convenient location for the whole of the north west and is easily accessible from Standish, St Helens, Warrington, Liverpool, Chorley, Preston, Manchester and Lancashire.